Trinity Health system executives take home heftier paychecks when they keep patients healthy and out of the hospital. The annual incentive pay for each executive, including the 93-hospital system's CEO, is docked if Trinity's total patient population doesn't show reduced rates of obesity, smoking, readmissions and hospital-acquired conditions. Hitting financial targets, on the other hand, receives little weight in the incentive plan. Trinity's strategy is a sharp departure from the status quo of CEO pay packages where financial incentives have long dominated. But it is a surefire way to focus top leaders' attention on the health system's mission to deliver better outcomes and lower costs to patients in the 22 states where it operates. “It's important to make sure you align incentives with desired outcomes,” Trinity CEO Dr. Richard Gilfillan said. Trinity's board of directors sets performance goals each year. Ten percent or more of each eligible executive's total pay is put at risk. Of that amount, 20% is tied to reducing hospital-acquired infections and decreasing readmissions; 20% to smoking and pediatric obesity rates; 20% to patient satisfaction; and 20% to workforce engagement. The Livonia, Mich.-based system's operating performance accounts for the final 20% of the at-risk pay. "It's important to make sure you align incentives with desired outcomes." Health system and hospital executive pay is still primarily linked to hitting financial targets, but a growing minority of providers ties CEO paychecks to population health improvement. Gilfillan, whose own compensation is tied to these measures, took home more than $2 million in total pay for the fiscal year ending mid-2015, including about $475,000 in incentives and bonuses, the latest IRS records show. The incentive structure puts Trinity, the nation's fifth-largest not-for-profit-health system, among a small but growing minority of health systems linking executive pay to population health measures. A few others, including Cincinnati-based Mercy Health and Detroit-based Henry Ford Health System, are also changing up their incentive plans to include population health in the mix. But the group is sure to expand as more health systems gravitate toward emerging value-based models and risk contracts that require hospitals to care for entire populations of people long after they leave the hospital. 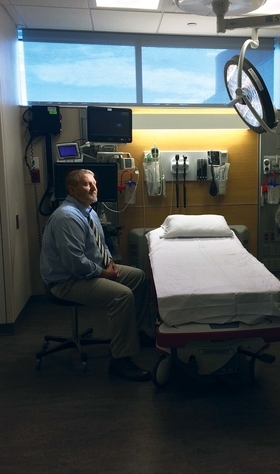 Despite shifts in the political environment, the volume-to-value push isn't going to slow, predicted Dr. David Nash, head of the Jefferson College of Population Health. “One of the ways it's going to be implemented is through executive compensation,” he said. A decade ago, most hospital CEO bonuses were linked heavily to financial targets, said Bill Dixon, co-leader of the healthcare executive pay and governance practice at consultant firm Korn Ferry Hay Group. Net income, profit, operating margins and cash flow—they were and are the easiest to track. Quality measures are far more difficult to follow, especially if patient data aren't integrated throughout the health system. “People don't now know how to measure population health in a detailed, reliable way,” Dixon said. And if systems can't measure it, they can't incentivize it. Back then there was also little reason to give CEOs incentives based on quality. Most public and private insurers paid hospitals on a fee-for-service basis (and still do). But methods are changing. Thanks to widespread adoption of electronic health records, it's easier to capture, track and share patient data across the continuum of care, thereby giving providers the tools to drive improvements in population health. Since Medicare began reimbursing providers based on quality and dinging them for poor performance in quality measures in programs like Medicare shared savings and value-based purchasing, providers have had to shift their focus to keeping people healthy long-term, rather than treating them only when sick. There's ample empirical evidence that incentives drive behavior, so it made sense for hospital boards to prod leadership toward quality by putting part of their paychecks at risk. Today, hospital executive compensation incentives are a mix of financial, quality, patient satisfaction and, increasingly, population health measures. Executive compensation experts say the weight is shifting toward the quality portion. Nearly all large health systems incentivize their executives based on cost, and 90% include quality measures, like hospital-acquired infections and readmission rates, in their annual plans, according to data from executive compensation firm Sullivan, Cotter and Associates. While estimates vary, anywhere from 20% to 35% of large health systems say they tie incentives to population health measures. Though uptake is on the lower side, interest is growing. “I would estimate that a third or half are actively discussing this among their boards,” said Donald Gallo, consulting director of healthcare executive compensation at Willis Towers Watson. He estimates that less than 20% link C-suite pay to population health. But it's hard to measure. 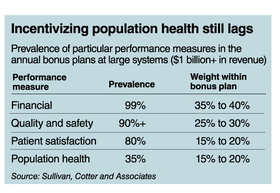 Health systems define population health in different ways, so the incentives under that umbrella vary widely. Henry Ford Health System's incentives, for example, differ vastly from Trinity Health's. But both say their organizations are committed to advancing population health, and their executive compensation schemes reflect that. Executive pay at Henry Ford is linked to measures including patient hypertension control, improvement in infection rates, reduction in hospital-acquired conditions and the deployment of the patient portal. The system's newly retired CEO, Nancy Schlichting, was paid $3.6 million in 2014, including $1.4 million in incentives and bonuses. Internal Revenue Service records showing the compensation of Henry Ford's new CEO, Wright Lassiter, are not yet available. The incentives are meant to drive positive outcomes, Henry Ford's senior vice president and chief human resources officer, Kathy Oswald, said. Though hard to pin down, population health management generally refers to improving the health outcomes of a defined group of patients. Population health strategies attempt to reduce the cost of care by improving quality and often include addressing the social determinants of health like socioeconomic status, employment, housing and access to healthcare. There's a growing recognition that social factors play a giant role in an individual's health outcome. The concept of population health is also at the heart of new value-based reimbursement models like bundled payments and accountable care organizations, which put providers financially at risk for patient care. Those models are driving health systems to implement population health management strategies so they avoid losing money in risk-based payment contracts. Some providers even hold leadership financially accountable for excelling in those models. Mercy Health physician Karla Ramirez Martinez, family medicine, works from a fully bilingual practice. Many of her patients are Hispanic and struggle with diabetes. Cincinnati-based not-for-profit system Mercy Health links its executives' pay to performance in Medicare's bundled payment programs for joint replacements, including the mandatory joint-replacement program and the voluntary Bundled Payments for Care Improvement initiative. Under these programs, providers are paid a set amount per patient for a single episode of care, such as a hip or knee replacement, rather than paying for individual services provided as part of that care. Mercy Health leadership receives a bigger bonus for keeping joint replacement patients healthy and recovering at home instead of in an expensive skilled-nursing facility. 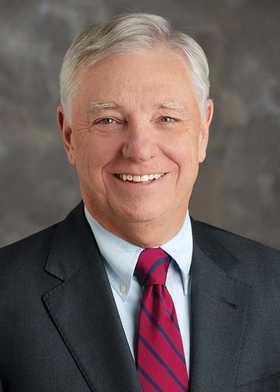 Executives at Mercy Health, which operates 23 hospitals in Ohio and Kentucky, also receive incentives based on how easy it is for patients to see a primary-care doctor; preventing avoidable readmissions to the hospital; combating the opioid epidemic by screening and referring patients to rehab facilities; and keeping the population healthy through preventive measures like screening for breast cancer or diabetes. Hitting a revenue target is also part of the incentive package. Executives can try for all six of these incentives once they pass two threshold measures: meeting the operating margin target and investing in programs that benefit the local community, which some see as a population health measure in itself. Mercy's board determines the weight of each incentive at the end of the year. Incentive pay for all of Mercy Health's hospital CEOs follows the same structure. Michael Connelly, the recently retired president and CEO of the system, was paid $2.1 million in 2014, including $556,000 in incentives. It took Mercy Health several months to whittle its focus down to these six incentives, and this is the first year this particular set will be used. 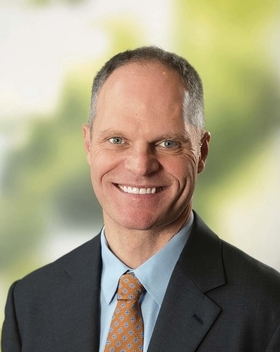 “A lot of organizations struggle because they haven't identified what's important, and that's not easy,” said Dr. Anton Decker, Mercy Health's chief clinical officer and president of Mercy Health Physicians, the system's partner physician group. That's one of the reasons why there's still a minority of health systems doing this. Others don't feel they have enough influence over patients to really affect populationwide change, and fewer still have the wide range of capabilities needed to manage populations or risk. Insurers might be more equipped to manage population health in some respects, Gallo of Willis Towers Watson said. "A lot of organizations struggle because they haven't identified what's important, and that's not easy." 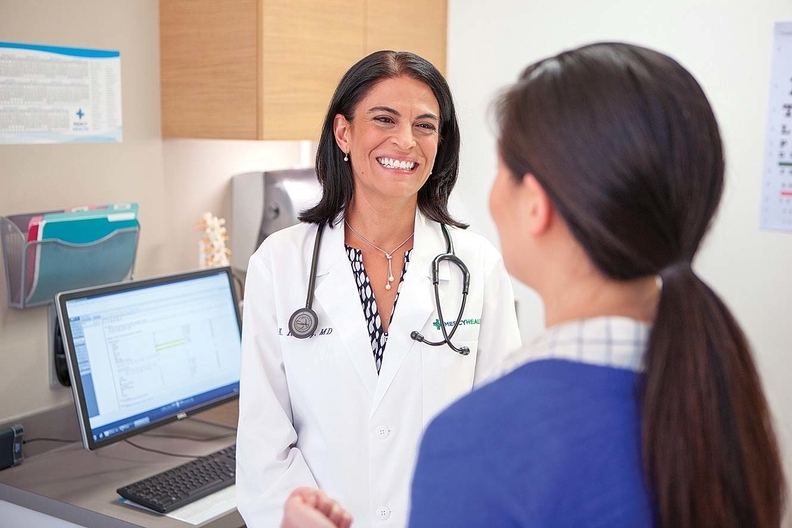 Other providers are simply reluctant to put so much emphasis on quality and population health when most payers are still in fee-for-service mode. But one of the biggest obstacles is the lack of good data to measure progress in reaching population health goals. “You can't do population health without the data—that's clear,” Jefferson College's Nash said. But it's expensive and time-consuming to integrate patient data across an entire health system. That's why these population health incentives typically show up only in the largest health systems. Moreover, lack of interoperability between one provider's health information technology system and another's makes it challenging for providers to get a complete picture of a patient's health. Most observers see the shift from volume to value as a foregone conclusion. HHS has set a goal to tie half of all traditional Medicare dollars to some type of value-based arrangement. While the new federal administration led by President Donald Trump is poised to disrupt nearly every corner of the healthcare industry, most experts don't expect the steady progress toward value-based care to fizzle out. “Both political parties believe this is the only way that they know of to manage the rapidly rising healthcare costs in the U.S.,” said Joe Damore, vice president of population health management at healthcare consulting company Premier. Healthcare costs topped $3.2 trillion in 2015, growing at a rate nearly double that of wages, federal data show. Damore also pointed out that the Medicare Access and CHIP Reauthorization Act of 2015, or MACRA, a physician payment model meant to shift physicians away from the fee-for-service model and onto a value-based payment system, enjoyed wide bipartisan support when it was passed in April 2015. When more health systems commit to risk-based payment arrangements, we'll start to see them get more aggressive with their population health-related financial incentives, Damore said. The health systems already tying their executives' compensation to population health measures are no strangers to risk-based contracts. But organizations that haven't begun moving down that path are unlikely to tweak executive pay until they have a few years' worth of experience learning how to manage a population of patients. “If only 5% of your business is tied to value-based payment, you aren't going to change everybody's compensation,” Damore said. But when 30% of the business funnels through value-based arrangements, health systems might start thinking about it.